Presentation cheques – What are they? We offer a huge range of large format printing here at kaizenprint.co.uk. One of our most recently introduced products has been an overwhelming success and as a result we have become the go to online printer for Presentation Cheques. What is a presentation cheque? A presentation cheque differs from a normal cheque in two main reasons. Firstly is is not an actual cheque and so its presentation is a formality, with a promise of funds to follow separately. Secondly and probably the most visible difference is the size of a presentation cheque over a normal bankers cheque. A presentation cheque is 15x-20x the size of a normal cheque as its primary use is that of ceremonial presentation for photoshoot or press call. A normal cheque wouldn’t be sizeable enough to see within a photo and so this calls for a jumbo or mega size. th the presenters logo or branding on it. 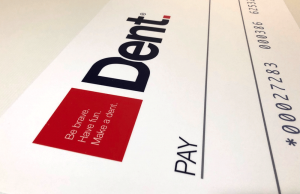 When placing your order, you can email us directly with your request of a bank presentation cheque or by uploading your own logo, we’ll create a proof using our giant cheque template and send this to you for approval before printing. Should I order a reusable presentation cheques or single use presentation cheques? We work with many businesses who want the cheapest large presentation cheque for their photoshoot and others who engage in this type of work on a more regular basis. With this firmly in mind, a reusable presentation cheque is much more cost effective. Every reusable jumbo cheque we produce is not only printed on the highest quality vinyl, but this is over laminated using a 5-year outdoor guaranteed lamination. While this is an over specification for a mega presentation cheque that will be stored indoors, this high quality print and lamination will with proper care last for years, as opposed to one off photoshoots. At kaizenprint.co.uk we are specialist suppliers of charity cheques. Since 2009 we’ve printed thousands of cheques for all manner of businesses, charities and community groups. We’ve seen our own cheques in photoshoots, at fundraisers and of course at charity events such as Children in Need. If you require a big charity cheque to complete your fundraising efforts, we’d be delighted to help in anyway we can. As a printing business, we’re incredibly focused on bringing the best quality products to all our customers. Whether business cards, posters or even presentation cheques, the quality of our products must be industry leading. With this in mind we added a matt lamination to all our reusable cheques free of charge increasing the durability of them even more so. To order your presentation cheque, simply place your order online or call our team on 028 9002 2474 if you have any questions.